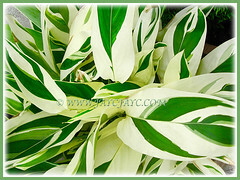 A jewel of a plant with mesmerising variegated leaves! 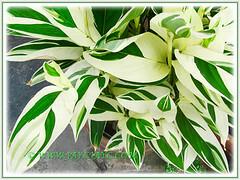 We first sighted this gorgeous plant with captivating variegated foliage at our Church of St. Francis of Assisi in Kuala Lumpur many moons ago. And recently on our trip down from Cameron Highlands, we went to a town in Pusing for lunch. I was flabbergasted when I saw Maranta arundinacea ‘Variegata’ again. 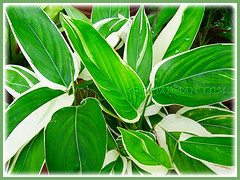 Truly beautiful with bicoloured leaves and each leaf is unique and designed differently. I stood transfixed and captured a few shots. That’s the beauty of God’s wondrous and awesome creation and designs! 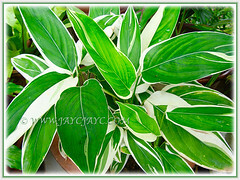 Botanical Name: Maranta arundinacea ‘Variegata’. 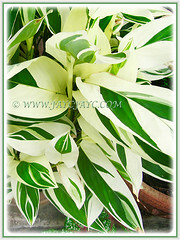 Common Names: Arrowroot, Obedience Plant ‘Variegata’. Etymology: The name of the genus Maranta was bestowed by Plumier in memory of Bartommeo Maranto, a physician of Venosa in Basilicata. Origin: Maranta arundinacea is native to Mexico, Central and Southern America and the West Indies. It is widely cultivated elsewhere as well. ‘Variegata’ on the other hand is a cultivar. Plant type: A herbaceous, evergreen perennial and ornamental plant. Features: Maranta arundinacea is a species of the genus Maranta that comprises of about 40-50 species of flowering plants and are popularly grown for their often strikingly beautiful variegated foliage. It is a herbaceous and evergreen perennial that grows approximately between 0.8 to 1.5 m in height. A fast-growing and clump-forming plant that spreads via its rhizome underground. Its leaf surfaces are dramatically speckled, usually with white edges and various shades of green. Leaves underside is lighter in colour. Each leaf is unique and patterned differently. Their papery leaves are oblong- or elliptic-shaped. Leaf blades come in varying sizes, small to medium and the larger ones are about 18 cm long and 7 cm wide. Leaves are smooth-textured and glossy, with an entire margin. Like many species of the Marantaceae family, this beauty has the characteristic feature of folding up their leaves at dusk to dawn by means of the tiny geniculum, an angular knee-like joint connecting it to the petiole, resembling hands put together in prayer. And, in the morning the leaves will return to normal position, that is, almost perpendicular to the petioles. Maranta arundinacea ‘Variegata’ is known to produce inflorescences. When home-grown, the plant rarely produces flowers. However, it is greatly admired for its exquisite ornamental foliage instead. Maranta arundinacea ‘Variegata’ can be easily grown with minimum care. Light: Bright light indoors or filtered sunlight to semi-shade for best growth and foliage coloration. Never leave them in direct sunlight that will bleach or scorch their leaves. Moisture: Moderate water needs. Keep soil constantly moist but never water-logged. Soil: Best grown in humus-enriched and loamy soils that can retain water, yet free draining. Nevertheless, it can tolerate any commercial garden soil with good drainage. Others: Remove withered or scorched leaves. Provide adequate warmth and humidity. Mist the plant regularly or stand potted houseplant in a saucer of pebbles filled with water to just below the base of pot. Feed once a month with a balanced fertilizer for foliage houseplants. Generally free from serious pests and diseases but mealy bugs and spider mites can be a problem occasionally. For subtropical and temperate regions: Hardiness: USDA Zone 9b – 11. Maranta arundinacea ‘Variegata’ is frost tender. For non-hardy regions, best to grow it as houseplant indoors or in a greenhouse. Keep them in a draft-free position, with constant, moderate to high temperatures as warmth is essential. Though humidity tolerant, the plants do benefit if you’re able to mist them regularly. At lower temperatures, water sparingly and allow soil surface to dry between waterings. Known to flower from summer to early winter. Feed once monthly with a balanced liquid fertilizer for foliage houseplants except during winter. Propagation: By division of clumps or separating the offsets. Usage: Maranta arundinacea makes great ornamental houseplants in homes. They are excellent for container gardening or raised planters and add beauty when located at the patio, deck or courtyard. 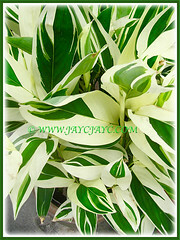 Its bold variegated foliage add colour and beauty when situated amongst a crowd of other plants. A stunner in the right surroundings. Ideal to be grown outdoors in the garden borders and beds. It is popularly grown in certain countries for its source of starch from the arrowroots (rhizomes) and for folklore medicinal purposes.